Tony Reynolds has long been a fan of Ronald Reagan. The Ohio-based Web developer and Gulf War veteran admired the former president’s oratorical prowess, focus on small business, and ability to reach across the aisle and longed for a way to remind today’s politicians what Reagan was like in action. He then found an unlikely inspiration: the late rapper Tupac Shakur. The Godfather of Rap found a sudden, explosive resurgence in popularity this spring after his holographic likeness appeared at the Coachella festival, performing with his former Death Row Records labelmates Dr. Dre and Snoop Dogg. Excited by the technology—which “knocked [his] socks off,” he told me—and by the prospect of resurrecting his hero for the present day, Reynolds contracted AV Concepts, one of the companies behind the Tupac hologram, in hopes of creating a Reagan hologram. (He also began raising money on a crowdfunding website, A Kick In Crowd, though he declined to disclose how much of the one million dollar goal he raised.) Little did he know he was stumbling into a long-burning fight: the GOP’s great battle over how the Reagan legacy survives. DESPITE REAGAN'S CONTINUING sky-high popularity in the Republican party, Reynolds actually didn’t envision his Gipper-gram as a partisan invention. A registered Independent, Reynolds wanted to use the hologram as a call for bipartisan support for small businesses (he’s already selected an old Reagan speech on the topic for the hologram to eventually deliver). Nevertheless, he initially thought the Republican National Convention would be the most logical choice for the hologram’s debut because he could piggyback on the media attention already focused on Tampa, thus increasing publicity for his project. The plan was to project the hologram outside the convention center on the night of Romney’s nomination speech, using it to promote the implementation of the recently passed, bipartisan Jumpstart Our Business Startups (JOBS) Act and call for similar across-the-aisle business reform. He told a few “well-connected Republican friends,” but did not publicize his plans. Now the same Republican friends told Reynolds that the convention organizers were none too pleased with this plan. “It would have overshadowed everything that would have happened at the RNC,” they told him, and he agreed, canceling his plans to debut the Reagan hologram in Tampa. But the larger question remains of whether, and to what extent, Romney should be tied to the fortieth president at all—a debate that the unwitting Reynolds now finds himself at the center of. The GOP's Reagan nostalgics have been publicly conflicted throughout the campaign about drawing parallels between the party's former standard bearer and its current one. Some conservatives have seen 1980 as an auspicious parallel to this year's election, believing that Romney can follow Reagan's “comeback” script from that year by convincing the country that President Obama is a feckless Jimmy Carter retread. (Our own Nate Cohn explored the idea recently here.) These are the partisans that proved most excited by the prospect of Reynold's Reagan hologram making an appearance—and an endorsement—before Election Day. But Reagan biographer and PR consultant Craig Shirley has publicly spoken out against the comparisons and described himself to TNR as “bemused” by the effort to invoke Reagan this year. “The Romney people keep pushing this storyline and I keep pushing back on it,” he said. “There are stark differences between the two.” While Shirley said a fancy projection wouldn't have reassembled Reagan's 1980 coalition, he acknowledged that it probably would have gone over well with the Reagan-infatuated convention crowd. “They are looking at Reagan through a gauzy distance of some 30 years, at only the imagery of Reagan, and not the hard truth or the philosophy. 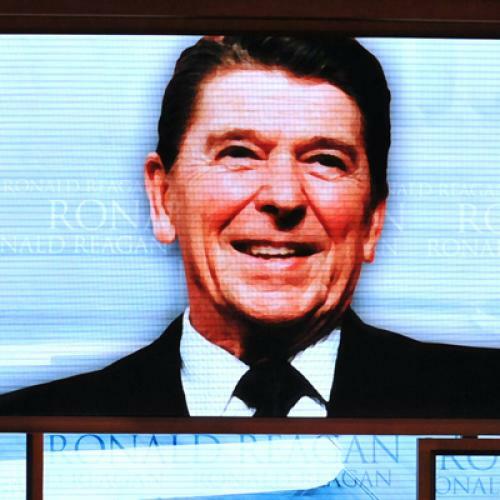 The way they treat Reagan right now is superficial”—superficial, just like the glorified light show in question. For his part, Reynolds is trying to stay above the fray and focus on finalizing the hologram, which he now plans to debut early next year. He’s keeping mum on anything more specific than that, and understandably so: He is already facing some competition from people who have contacted him about working on their own Reagan holograms (AV Concepts is equally tight-lipped about its involvement, although it did confirm its contact with Reynolds.) But despite Reynolds's assurance that he won’t unveil his resurrected Reagan in the weeks ahead, some GOP diehards are still holding out hope that the ghost of Reagan will publicly bless their current would-be savior.